Fred’s Van is a food service for people who are experiencing homelessness or are at risk of homelessness and marginalisation in Adelaide. Fred’s Van has over 500 volunteers and provides approximately 550 meals a week. We support some of the most vulnerable people in our community who experience a range of issues such as homelessness, social isolation and unemployment. 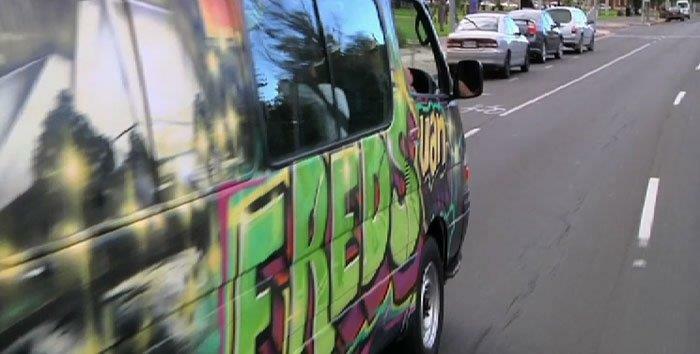 Those forced to live roughly can access Fred’s Van for a hot, nutritious meal, blankets, clothing and food vouchers, donated books, social connection and referrals to other community service and Government agencies. The service provides a hot meal, fruit and drinks, blankets and beanies at eight sites across Adelaide, as well as one site each in Port Lincoln and Port Pirie. The Adelaide sites are currently: Aldinga, CBD, Christie Downs, Ferryden Park, Elizabeth, Gawler, Semaphore and Salisbury. Who benefits from Fred’s Van? Fred’s Van benefits disadvantaged people and this benefit extends to family and friends of the people we serve, other not-for-profit community services and Government agencies which assist disadvantaged people. The service provides 30,000 nutritious meals a year, lifting personal health and inspiring the army of volunteers that enjoy making a positive difference to the well being of people at a disadvantage. We also practice food rescue at all sites. Ultimately the service provides a tangible benefit to the whole community by ameliorating the impact of major disadvantage on people. Yes. Fred’s Van offers many opportunities to volunteers, all of which only require a few hours a month - find out more here. You can donate food and/or blankets, volunteer in the Fred’s Van team helping to prepare and serve the food, or donate funds to provide meals from Fred’s Van. For more information on Fred's Van please contact our Co-ordinator on (08) 8112 8720.